At the end of this post, please leave a comment for a chance to win a $50 Sherwin-Williams gift card. 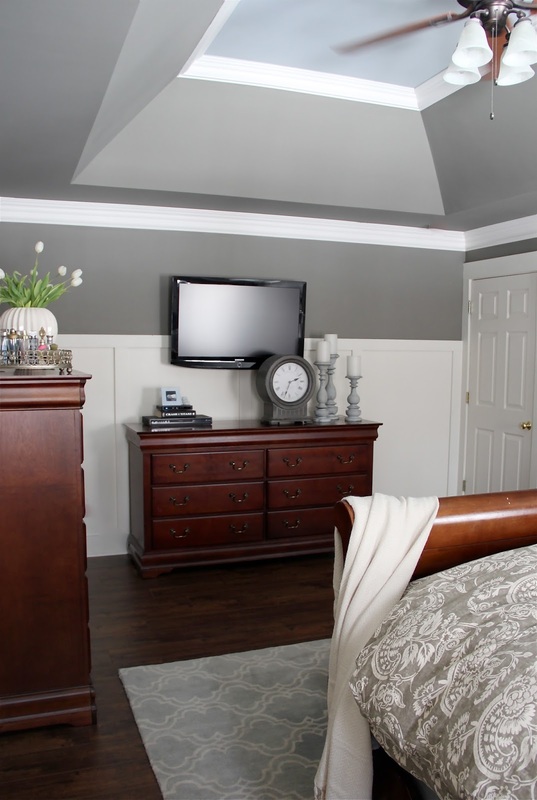 Remember the other day I shared my design plan for my master bedroom makeover with Sherwin-Williams? If you missed it, I coined the term "liveable luxury" for this project because it describes exactly what I've always wanted our master bedroom to convey. A little bit of luxury yet casual, comfortable and inviting at the same time. To achieve this I laid out a plan that included luxurious bedding, new art/lighting/accessories, some of my favorite personal treasures and a dramatic ceiling treatment. Well guess what? The room is done and I can't wait to share it with you today. I kept a lot of my existing design elements in place, yet my room has a totally new feel. The custom ceiling treatment is by far the most dramatic change in the space. You can see in the before photo above that our room originally had a large white tray ceiling. To draw more attention to this great architectural feature, I decided to have crown molding installed around the perimeter of the tray at the base and around the top. I chose extra thick moldings to provide that hint of luxury I desired. Once the moldings were in place it was time for paint. You may remember in my first post how I was playing around with the Color Visualizer from Sherwin-Williams to help me decide on the new color. This is just one of the three helpful color selection tools available from Sherwin-Williams. Using the Color Visualizer, I was able to upload photos of my bedroom and paint them with the virtual paintbrush. After experimenting with a few different color combinations and comparing the design board I created to the color visualizer mock ups, the colors I chose were: SW 7046 Anonymous, SW 7652 Mineral Deposit and SW 7002 Downy. 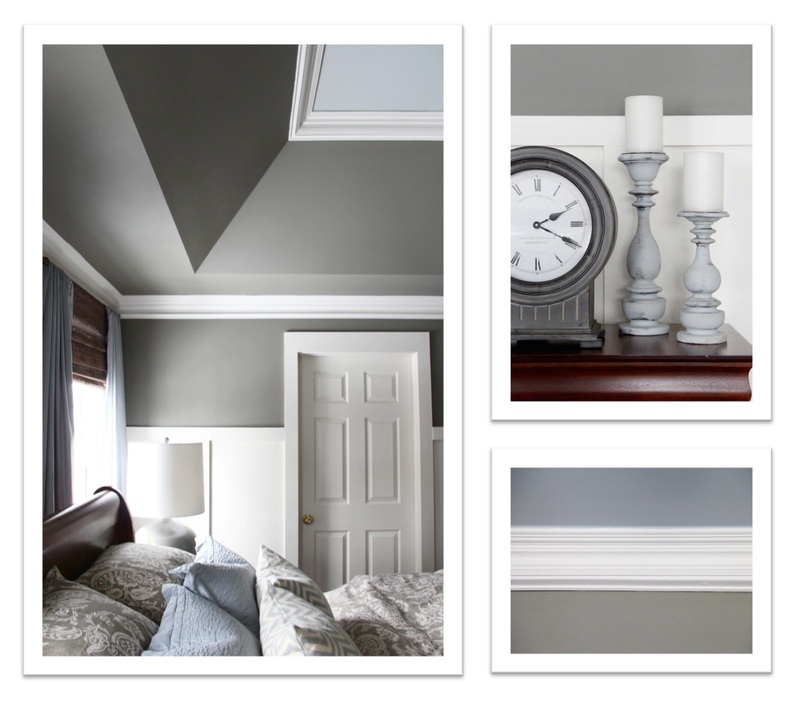 I chose SW 7002 Downy for the new moldings and SW 7046 Anonymous for the walls and the bottom part of the tray ceiling. Lastly, I picked SW 7652 Mineral Deposit for the inside of the tray ceiling and to use around the room in decorative accents. Painting the ceiling a color made the room feel bigger and cozier at the same time. Before, the cold, white ceiling brought the height of the room down visually. Now the eye goes straight up to the highest point in the space. The richness of SW 7046 Anonymous around the entire perimeter of the space feels like a big warm hug. Not to mention, the high contrast between SW 7046 Anonymous and SW 7002 Downy really made the new moldings stand out. A full post dedicated to the molding project is coming soon. Some of the first things I brought into our new space were some of my favorite photos of our three children. To tie them into the new color scheme, I had them printed and in sepia tones, framed in antiqued gold frames and then I painted plain white mats with leftover ceiling paint. I purchased a pair of extra large, vintage inspired blue lotus flower prints to anchor the display. Adding hooks to the bottom of the shelf gives me a place to hang our family Christening gown. It also gives us a place to hang our clothes at night for the next day, making our new space more "liveable". Being surrounded by these special items everyday in my bedroom is my idea of "luxury". Our faux silk drapes create the illusion of luxury, but on a dime. I made these from sateen king sized flat sheets. We use our roman shades for privacy, therefore the drapes are there to soften the design. They play very nicely with the new ceiling color. I added a little more of the gray/blue color on the other side of the room with accessories. 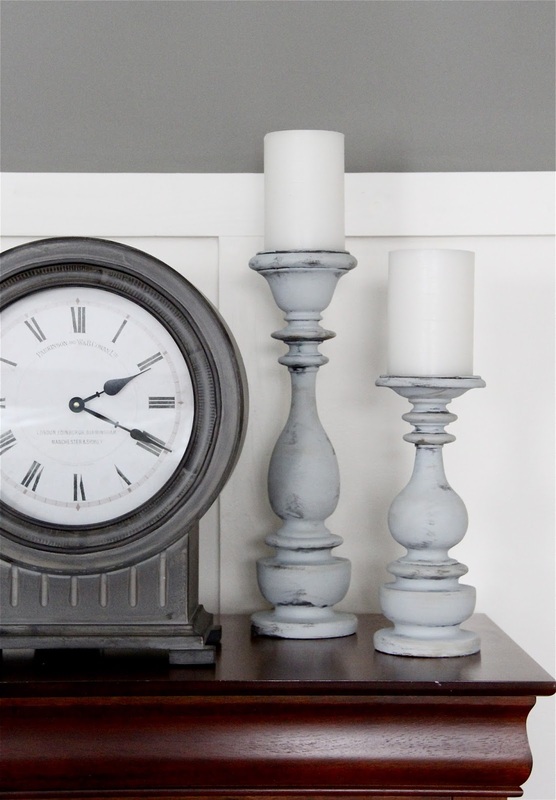 I painted a set of candlesticks I picked up at a consignment shop with SW 7652 Mineral Deposit using a dry brush technique. A tutorial on this project is coming soon. 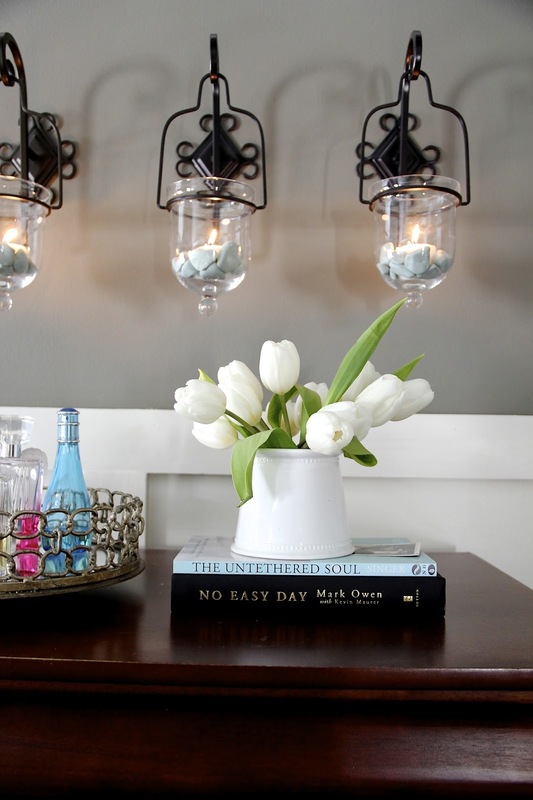 I've had these hanging candle sconces for a few years, but I have to say that they show up so much more against the new paint color than they did before. New lamps flanking the bed provide functional task lighting and also pull double duty as a major design element. The contemporary shape helps to update the look of our traditional style furniture. I think their extra large scale provides a bit of whimsy. For the bed, I selected crisp white cotton sheets and a fluffy new gray and cream duvet. I already had the blue coverlet and loved the way these colors look together. Keeping the space liveable meant having things we use daily easily accessible and out in the open. To make our perfume/cologne collection look pretty, I put it on a gorgeous chain link metal tray and placed it on the dresser. Our bedroom design has come together in stages, over a period of years. It's been a process over time starting with the addition of board and batten wainscoting (a DIY project), replacing the builder grade trim with extra thick pine boards, changing out the carpet for wood laminate floors and finally this addition of a custom ceiling treatment. The new ceiling treatment really finishes off the space. Ceilings are a great opportunity for drama and sometimes they tend to be overlooked. My bedroom was one of those instances. It's feeling are no longer hurt thanks to Sherwin-Williams and Blogher. This campaign gave me the opportunity to show how the addition of moldings and paint on the ceiling can have a big impact on your space. I'd also like to give Sherwin-Williams a huge shout out for their Harmony paint line. After using this paint, we were able to sleep in our room the very same night. It actually helps reduce common indoor odors from your pets, cooking and daily life to help rooms stay fresher longer. Harmony contains new technology that helps promote better indoor air quality by reducing VOC levels from potential sources like carpet, cabinets and fabrics. Thanks for visiting and touring my new master bedroom. Now it's your turn, for a chance to win a $50 Sherwin-Williams gift card please share...what room would you makeover with Sherwin-Williams? You can find my friends at Sherwin-Williams on Facebook, Twitter, Pinterest and YouTube. 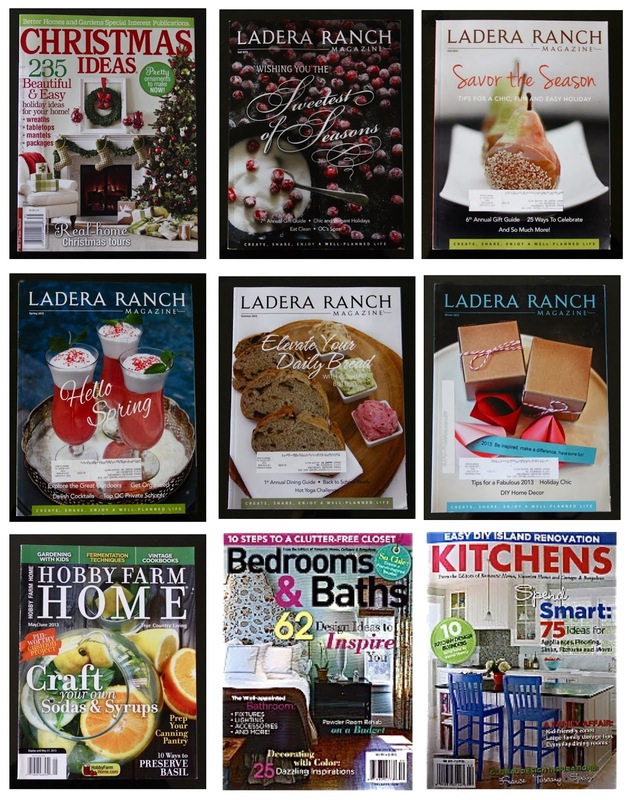 This sweepstakes runs from 6/2/2014-6/22/2014. 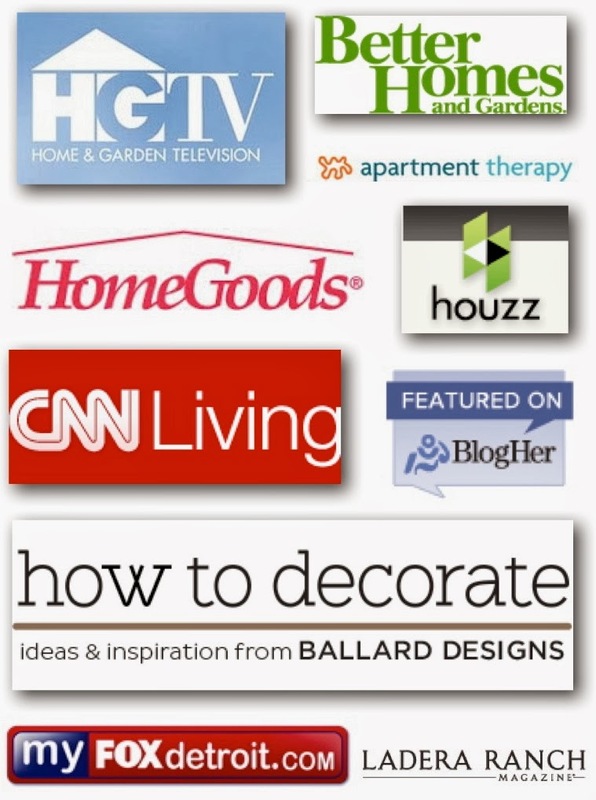 Be sure to visit the Sherwin-Williams brand page on BlogHer.com where you can read other bloggers’ posts! My bedroom for sure. It needs a fresh look. My kitchen needs a mini makeover and a $50 gift card for paint would sure help! beautiful room, Sarah! I would make over our master bath! Beautiful I love the warm gray and how you contrasted with the high ceiling. Very luxurious! My upstairs hallway is seen by us and every guest and is looking so drab! I have a huge master closet that needs some TLC. Your room looks beautiful! I want to redo my master bedroom as well. Oh what a beautiful and restful bedroom - you must be thrilled! I need to refresh my entire downstairs - it's looking really tired! The master bedroom is on the top of my list. The master bedroom and bathroom are at the top of my list. My bedroom. It really needs refreshing. Old wallpaper torn down and fresh paint put up. Love the new color in your bedroom! Looks awesome! I would paint my kitchen. It is the last room on my first floor that needs painted. Currently "builder beige"! My sons who share a room need an awesome space, so thats the room I would change up. The hook idea is fantastic, and I am going to implement that! My sons who share a room need a new, exciting space. So that is the room I would change up. Your idea of the hooks is awesome! I love seeing someone use Sherwin-Williams colors, as that's what I have available in my area, plus their paint is really good! The bedroom is so calm and relaxing! I would make over my master bath or hall bath. Love your new room! Your master bedroom is lovely. I would redo my loft/sewing studio. I would paint my kitchen. Your bedroom looks beautiful. I would make over my dining room. 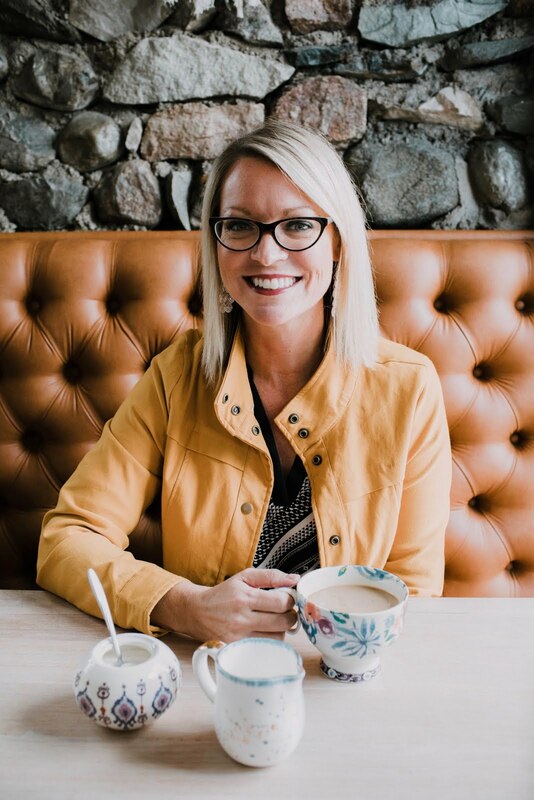 It is the first room you see when entering our house and I would love to update the tray ceiling and trim to give our dining room a fresh, inviting look. I would paint my master bedroom.....we moved in last fall and I still need to pick out paint colors for the bedrooms. I am in the process of repainting all of my rooms in my house. I love SW and use their paint all the time. So far I have picked Oyster Bay, Bleeker Beige and Canvas Tan. I also wanted to let you know I purchased your bedroom flooring after seeing how nice it looks. The master bedroom needs some serious work! 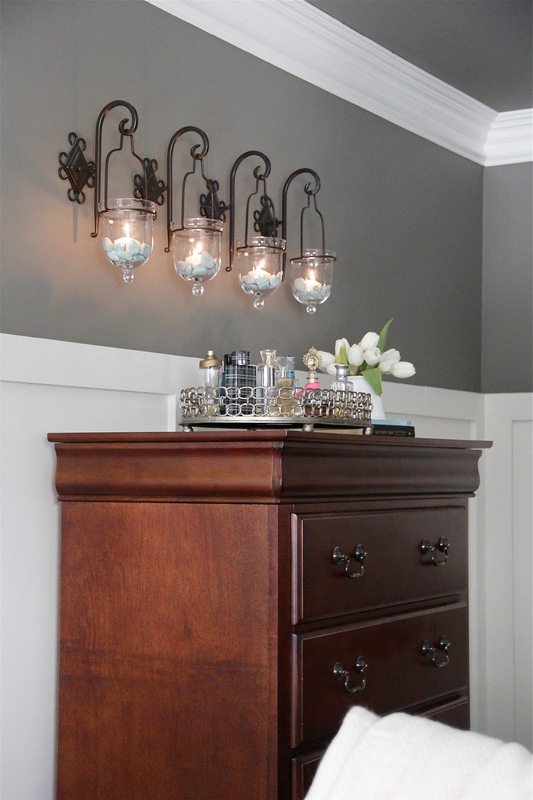 I love the candle sconces and the moulding around the ceiling....giving me ideas for my Master Bedroom!!!! That is the room I would paint! Great job Sarah! My daughters are getting their own bedrooms this year, so I would like to re-do two bedrooms to make into two new "tween" bedrooms! My dining room, kitchen, bedroom, and two bathrooms all need to be painted. Very pretty bedroom. I would paint my guest bedroom. I would start with the master! Oh my gosh, your room looks amazing!!! I was looking forward to this reveal!!! 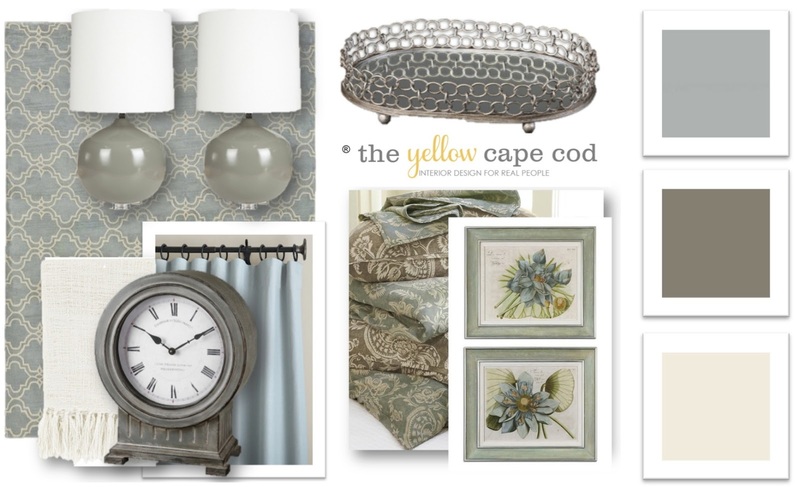 I would makeover our master bedroom (it's a new construction home and a blank palette)!!! 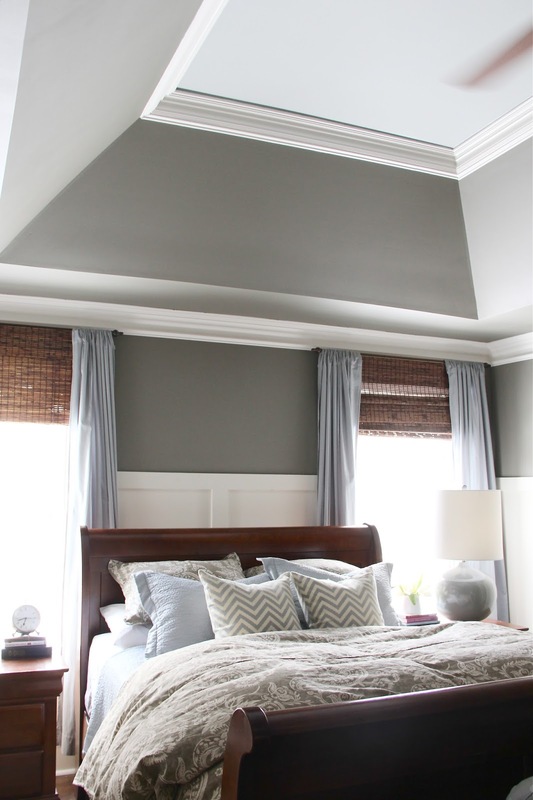 We have a tray ceiling in our master bedroom also, and I would love to add moulding to ours!!! 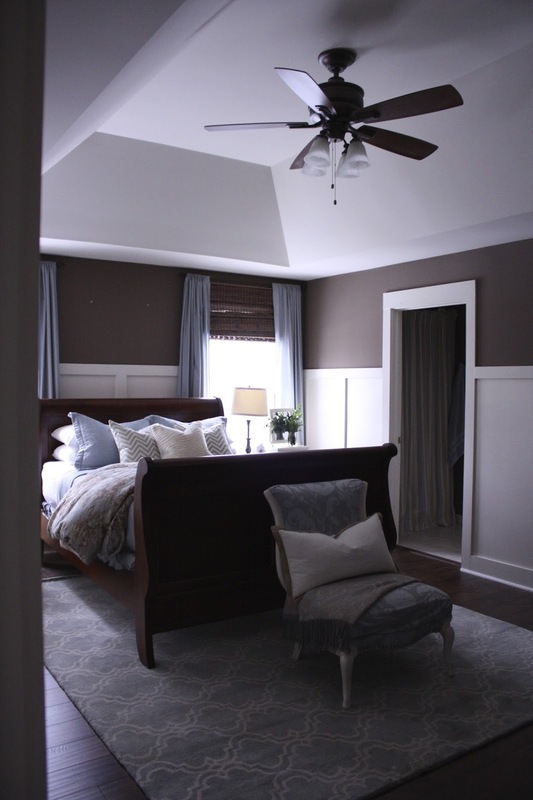 Your master bedroom is stunning! I would love to try that color scheme & ceiling treatment in my bedroom well. I would make over our living room, it needs some attention! I really like the ceiling treatment. My guest room needs a much needed makeover. Love Sherwin Williams paint! We just moved into an old farm house and used their paint! Absolutely gorgeous, Sarah! I love it all! The transformation of the ceiling is amazing. Oh I love what you did in the master bedroom. Very pretty. Love the color combination! I would really like to repaint our schoolroom. The ceiling treatment is inventive and classy. Love! I love this room! The colors are great. My main room is in serious need of a repaint. That is what I'd do. I would repaint my bedroom! Great makeover/update! My master bedroom is the only room in the whole house that has not been repainted since we moved in...it could use some paint lovin' too! Please enter me in the giveaway. I really want to paint my living room. That's beautiful! I'd love a chance to make over my bedroom! I would love to make my den over. It so desperately needs painting. I would make over m living room with Sherwin Williams. Gorgeous! I would love to do something similar in my master. Love the colors. My bedroom needs to be repainted. I had painted it a moss green and then the hospital where I work decided to make that the color my dept has to wear. I am so over it. I am in the midst of several painting projects-I would use it for my kitchen! We have lived with builder beige for 15 years before finally researching and deciding on Sherwin Williams paint. For the past 4 years we have been painting and updating rooms in the house, we have one room downstairs yet to do. It use to be our son's small bedroom, sewing room, then a computer room/nursery for visiting grandbabies. My treadmill is now out of the basement and in this room, I would love to paint this room and make it more inviting to inspire me to get walking on that treadmill more often. We have lived with builder beige for 15 years before finally researching and deciding on Sherwin Williams paint. For the past 4 years we have been painting and updating rooms in the house, we have one room downstairs yet to do. It use to be our son's small bedroom, sewing room, then a computer room/nursery for visiting grand-babies. My treadmill is now out of the basement and in this room, I would love to paint this room and make it more inviting to inspire me to get walking on that treadmill more often. I need to paint my living room. I love Sherwin Williams paint and would love a gift certificate to buy some! Our master bathroom for sure! It really needs a new coat of paint...the pale green in there is so boring! Love this room. We're going to makeover our family, living and kitchen areas. I'd love to redo my downstairs bathroom. I liked it when we moved in - it was dramatic and fun. But now it's just dreary and dark. Our bedroom for sure. It's very tired and needs a fresh facelift. We have an open floor plan, so I would paint most of downstairs, the stairway, and the upstairs loft. I love the paint! We use it in our house. Great quality! I love that brand paint. We currently have in our house. I'd like to redo our bedroom. I have the same night stands and tall dresser. I had made glass tops for them so they would't get scratched.